The maintenance backlog of the railway network and the fact that most of the lines are single track negatively affect the performance of rail traffic. 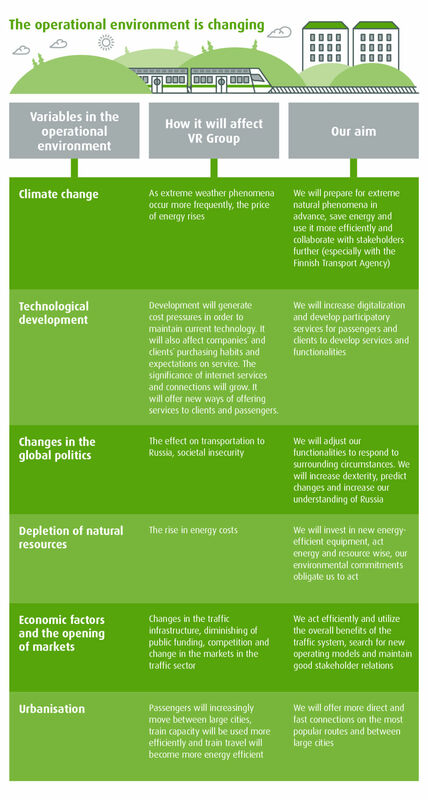 Megatrends have an impact on the operating environment. The fourth railway package published by the European Commission in 2013 was adopted in 2016 and it will enter into force after a national transition period. The aim of the fourth railway package is to make railways more competitive and to create a single European railway area. VR is preparing for competition in railway passenger services. VR has exclusive rights to the provision of long-distance train services until the end of 2024, but the Ministry of Transport and Communications has announced that it intends to speed up the opening of railways to competition. Trains are in continuous competition with other modes of transport, especially with bus and coach services and private vehicles. About two-thirds of the net sales of commuter traffic are generated in the contract traffic arranged by Helsinki Region Transport (HSL). VR and HSL have concluded a contract on operating the commuter services, which will remain in effect until summer 2021. Preparations for competitive tendering in the commuter traffic are continuing and the aim of HSL is that the framework of the tendering process would be clear by the year 2018. Large amounts of goods and passengers move by rail between Finland and Russia. Russian traffic accounts for 40 per cent of the freight traffic on Finnish railways. Under the new Finnish-Russian Railway Traffic Agreement, freight traffic between Finland and Russia was opened up to competition at the end of 2016. All domestic freight operations of VR Transpoint are open to competition. VR Track wins each of its contracts through a competitive tendering process. The competitive situation in the infrastructure engineering sector is tight. The Finnish Transport Agency, who owns Finland's railway network and receives its funding from the state budget, is the largest customer of VR Track. The volume of track construction and maintenance and the engineering consultation work depend on the appropriations of the Finnish Transport Agency. The maintenance backlog of the railway network is estimated at around EUR 1.1 billion. The Ministry of Transport and Communications has appointed a parliamentary working group, which is tasked with determining how the Finnish transport network should be maintained and developed. Megatrends have an impact on the operations of all companies. Digitalisation and the new service needs arising from it, urbanisation, and efforts to slow down climate change as well as the changes in operating practices accompanying it have a significant impact on business activities now and in the future.